Siege of Dragonspear, because that's what you do with dragonspears. you siege them. It's expansion time! And when we say "expansion", boy do we mean "expansion". Beamdog recently announced a nice little update to Baldur's Gate: Enhanced Edition titled Baldur’s Gate: Siege of Dragonspear. And by "little", we mean an all-new adventure with 25 hours of gameplay, complete with co-op! Siege of Dragonspear fills the gap between Baldur's Gate: Enhanced Edition and Baldur's Gate II: Enhanced Edition like some sort of globby glue substance. 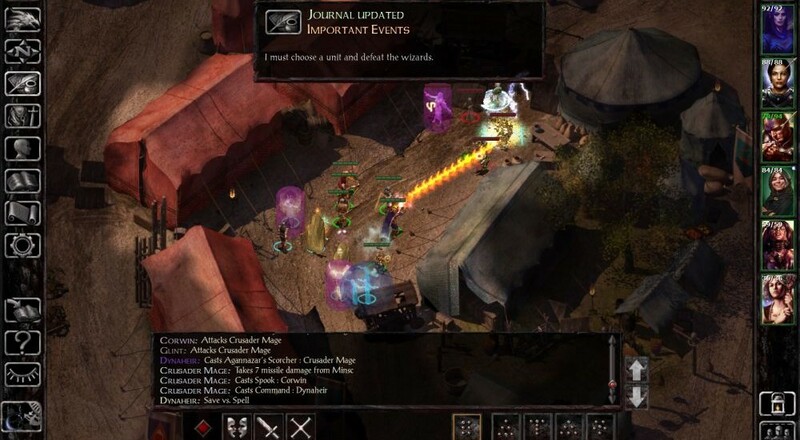 The gameplay will remain largely the same as previous Enhanced Edition releases, meaning you'll run around an isometric world beating things up, gaining experience points, and just generally RPGing the heck out of things with your friends. Co-op supports six online cross-platform players, which is about as awesome as it gets. Pricing hasn't been announced for Siege of Dragonspear, but the platforms will include PC, Mac, Linux, and later iOS and Android. You'll need to own Baldur's Gate: Enhanced Edition to play the expansion, but the good news is that characters and saves can be transferred for a seamless adventuring experience. Four new characters and at least four new locations have already been teased. No release date has been set, so hold your spears and don't start sieging just yet! Page created in 0.4312 seconds.